The bio of Stuart Luttrell Peter | Launceston Then! Stuart was born in 1894 to Claude and Lillie (nee Harris) Peter at Craigmore, Launceston. His father was part of the local Peter’s solicitors in Launceston. He was educated at Pendruccombe school, Dunheved College and Blundells. He began studying law but like so many of his generation Stuart’s life was interupted by World War One and he served as a Second Lieutenant with the 5th Battalion of the Duke of Cornwall’s Light Infantry seeing action in Palestine. He eventually rose to the rank of Captain. 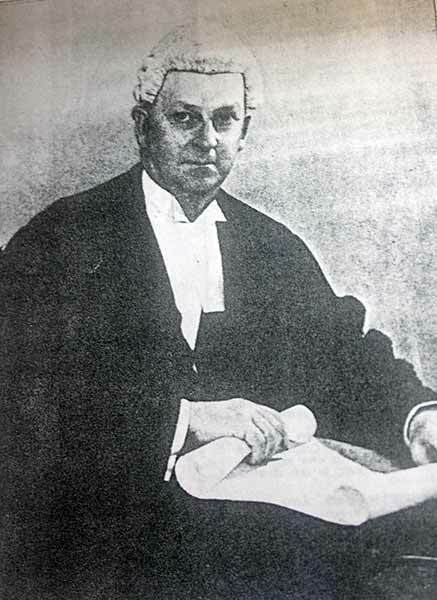 In November 1919 he was successful in in obtaining a 1st class (Honours) and was also awarded a Law Society prize after being placed ninth in a list of 294 candidates who succeeded in passing the examination. On passing his exam he joined the family’s Law firm of Peter, Peter and Sons at the bottom of Windmill Hill. He had also been known to tread the boards having appeared in the Launceston operatic and Amateur Dramatics Society’s production of ‘Mikado. 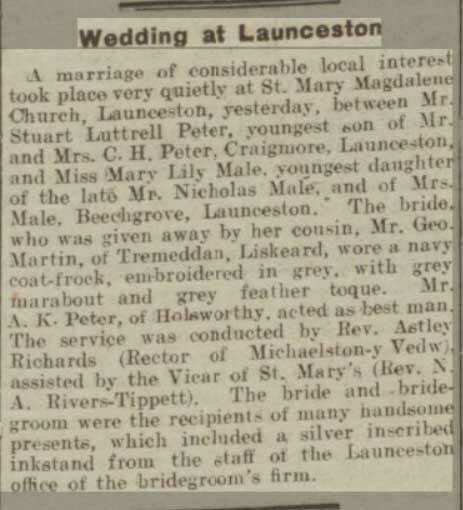 In January 1921 Stuart married Mary Lily Male at St. Mary Magdalene Church, Launceston and they set up home at Trenance, Windmill Hill, Launceston. 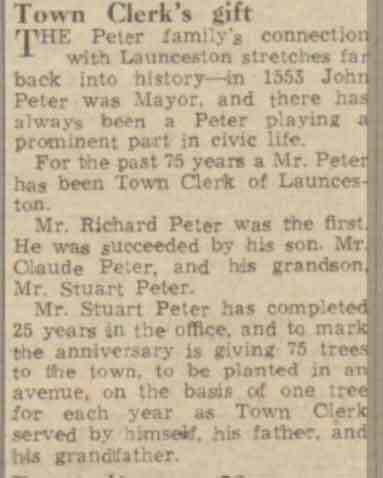 In 1925 on the retirement of his father, Claude as town clerk, Stuart took over thus continuing the family tradition started by his grandfather Richard Peter in 1874. He later also became the clerk to the borough magistrates’ court. He took a keen interest in education and was Chairman of the Governors at Launceston College. 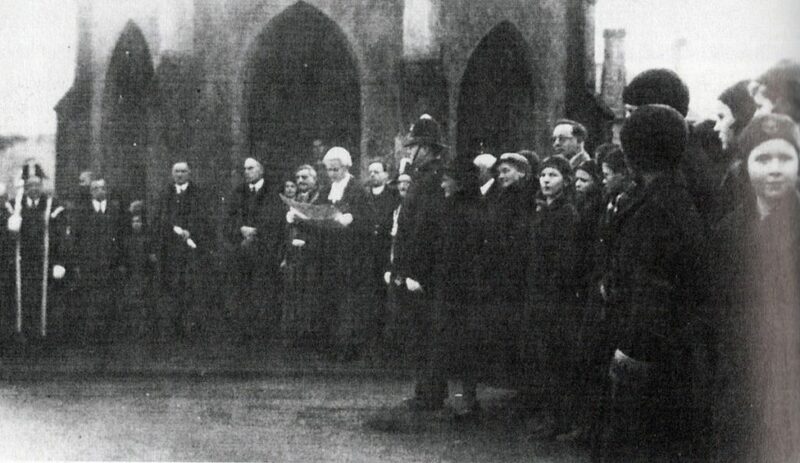 Town Clerk Stuart Peter reads the proclamation of King Edward VIII at Newport January 23rd, 1935. During World War Two he was the Sub-Controller for the A.R.P.. After the War in 1946 he became a Bard to the Cornish Gorseth (Maplen An Dre) and he also served upon the Plymouth, South Devon and East Cornwall Hospital Group committee. 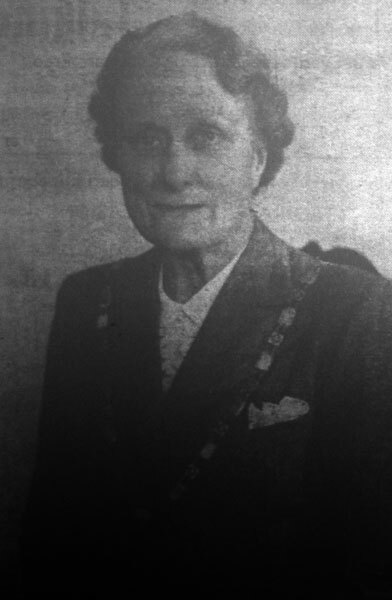 He eventually became mayor (below with his wife the mayoress) in 1953, having relinquished his role as town clerk, which was unusual in that he was neither an alderman or an elected member of the town council. He was appointed a honorary Freeman of the borough of Launceston. 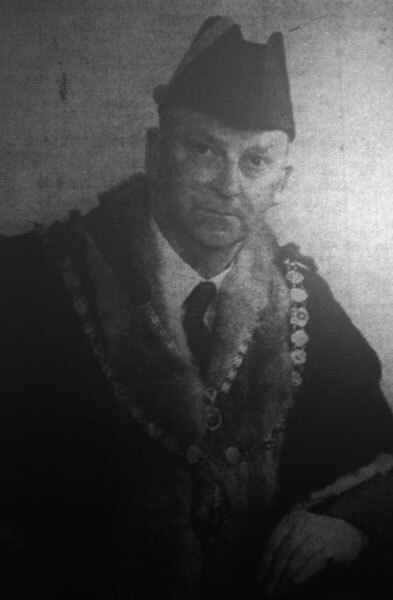 He had been president of the Launceston agricultural society, chairman of governors of Launceston College and chairman of the local Trustee Saving’s Bank. He was a keen gardener and was closely associated with the Cottage garden society in the town. 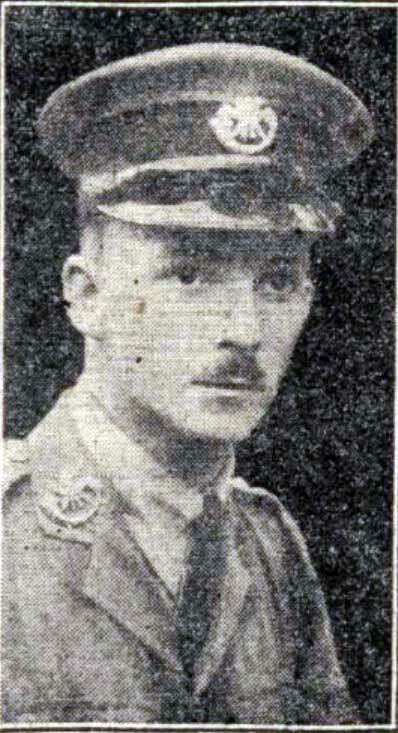 He also served as captain of Launceston Golf Club. 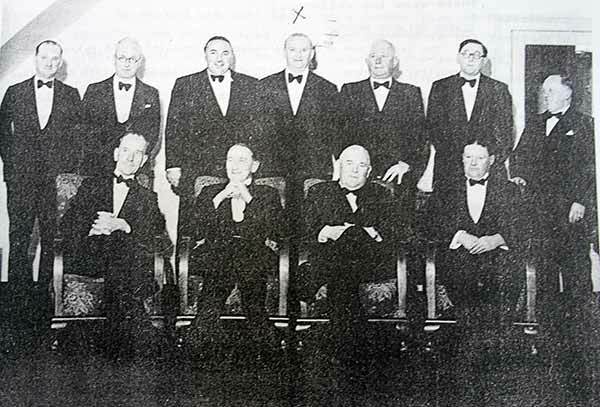 Above Launceston Golf club past Captains at a dinner held in 1951 at the White Hart Hotel. Standing left to right Reg Prout senior, Bill Matthews,Roger Parnell, Stuart Peter, Bill Kivell, Ted Longman and Fred Smith. Seated Phil Sanders, George Wilson, Tom Fulford and John Dingle. 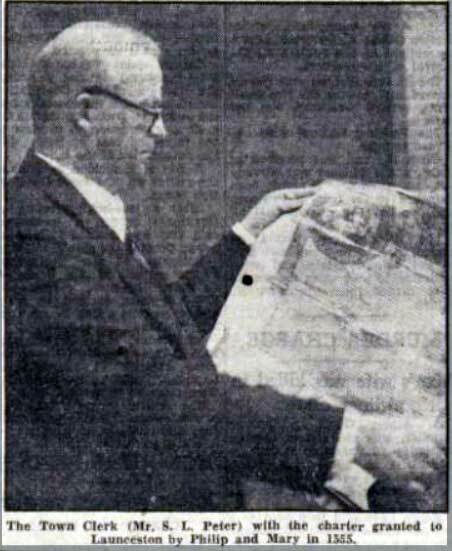 Stuart Peter (Town-Clerk) in 1949 with the Towns Royal Charter granted in 1555. Stuart passed away at his home in 1971.